We are pleased to announce that JINYA Ramen Bar, a 2,500-square-foot full service, sit-down restaurant, will be opening in Fairfax’s Mosaic District late Spring 2016. JINYA Ramen Bar, which started the Ramen Revolution in Los Angeles, currently has 11 additional locations in California, Las Vegas, Texas, Chicago, Atlanta and Canada. With the expansion, the Mosaic location will become the flagship store of the East Coast. Inspired by JINYA founder Tomonori Takahashi’s experiences with both Western and Eastern culture, JINYA Ramen Bar specializes in authentic Tonkotsu ramen boasting bold flavors and a wide variety of customizable options for the American palate. The food preparation process includes simmering the broth for over 18 hours which delivers a robust, flavorful experience. Patrons can expect a wonderful table-service dining experience with JINYA’s expansive menu offering something for everyone. In addition to Tonkotsu-style ramen (heavily pork influenced broth), JINYA offers dishes such as the JINYA Chicken Ramen, Vegan Ramen, the “Cha Cha Cha” for garlic lovers, quinoa salads, rice bowls and tapas - to name a few. Patrons can pair their dishes with a selection from the beverage program that will involve local craft beers, Japanese inspired cocktails, sake/wine and seasonal house-made non-alcoholic beverages. JINYA’s space, designed by LA-based firm Ikedo Design, will contain a 100-seat dining room, a nine-seat full bar and a 34-seat outdoor patio. JINYA will be open daily for lunch, dinner, and happy hour. 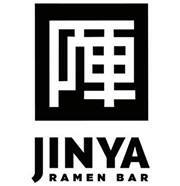 For more information, please email contact@jinyamosaic.com or visit www.jinya-ramenbar.com. Stay connected with #JINYAMosaic on Facebook, Twitter and Instagram. JINYA Ramen Bar is a unique concept that artfully blends traditional Japanese ramen with modernized ambiance and offers a dynamic array of flavors to captivate the taste buds. JINYA Ramen Bar serves up rich, hearty broths perfectly balanced with complementing ingredients that allows the diner to add an array of toppings such as tender pork, beautifully poached egg or fresh garlic to ensure that all ramen bowls are one-of-a-kind creations. Diners have a handcrafted ramen experience, and the dining moment is elevated by pairing the perfect ramen bowl with fresh tapas, a chilled craft beer or a signature cocktail that will complement the fifth basic taste profile of umami. JINYA distinguishes itself by focusing on the curated experience that comes from being able to choose exactly what goes into the dish. This has always been Chef Tomonori’s intention, a contemporary ramen bar that redefines modern Japanese dining with incredible food and the perfect atmosphere, all at a reasonable price. JINYA has its roots in Los Angeles and has other locations in California, Las Vegas, Texas, Chicago, Atlanta and Canada, with additional locations coming soon to the metro area of Washington, DC. JINYA’s new location is located in the heart of Mosaic District at 2911 District Avenue, Fairfax, VA 22031.